Hotel The Crystal combines stylish and superior facilities with a ski-in/ski-out location, and now has a 4 star superior rating. Highlights include spacious designer rooms, a state-of-the-art spa and leisure area and a large comfortable bar and restaurant. 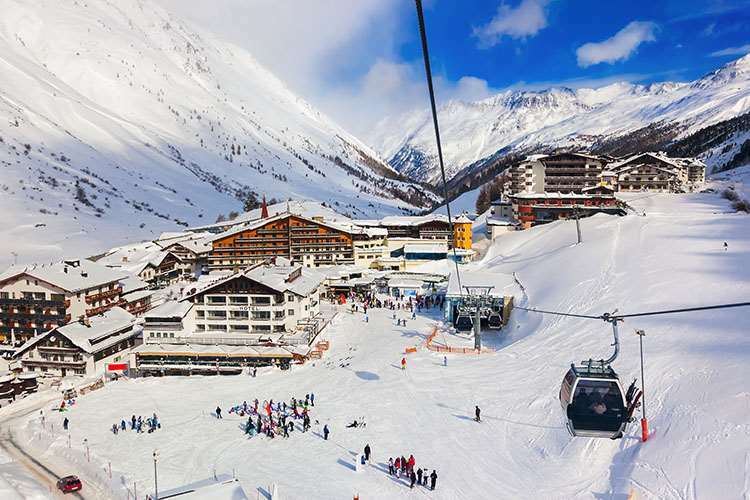 A short walk from the centre with an ideal location next to the Festkogel gondola and ski hire shop, skiing to and from the Crystal is very easy. Our guests appreciate the direct connection from the ski room to the lift. Standard Austrian twins in the main building sleep up to 3 and have shower and seating area. New wing 'Basic rooms have bath, separate shower, lounge area and balcony and sleep up to 4. Large Designer Classic Austrian twins in the new wing sleep up to 3 and have bath, separate WC, lounge area and balcony. Recently renovated Family Basic Plus junior suites in the main building sleep up to 4 and have bath, separate lounge area, minibar and balcony or terrace (on request). Single rooms in the main building have shower. All rooms have digital TV, radio, telephone, safe, bathrobes and hairdryer. Have skied Austria on several occasions but Obergurgl was a new place to visit. Last year did Val D'Isere and wondered how well Obergurgl would compare. I guess it depends what you're looking for (apart from good snow and slopes) but for me Obergurgl certainly ticked all the boxes from the start. Probably the most stress free journey from home to resort and staying at The Crystal Hotel was a very pleasurable experience. Very clean accommodation and although I had a single room, the space offered was pretty ample and included a private balcony. The staff are all friendly and very helpful - nothing was too much trouble except booking external restaurants (not surprising i suppose). Afternoon tea and snacks were free and pretty good - super apple strudel. The bar area is a great feature of the hotel - plenty of space and very relaxed indeed. The quality of tuition at Obergurgl ski school was superb (have skied 9 times but wanted to be challenged and to improve my technique AND didn't want to ski alone). Its surprising how many bad habits one picks up over the years and so it was good to be taken back to basics but within the same hour led down black runs totally in control The slopes empty - no ques at the lifts - and were well groomed with very few snowboarders. Being a high altitude resort the snow was mostly excellent and the weather was amazing. The resort is quite compact and apres ski mainly takes place early evening - great for those of us who want to be up early to ski. Some great restaurants including the Belmonte Pizzeria - excellent Italian pizzas and pasta at good prices - and Picnic. Unfortunately, on the 3rd ski day I broke my leg and so my skiing was brought to an instant halt and due to having surgery i was unable to experience a lot more of what Obergurgl has to offer. However, i'm planning next year's trip to try it all again at the same place!